Alfa Romeo introduced a new six cylinder range in 1962, the 2600 Berlina, Sprint and Spider. The Berlina was Alfas first post war six cylinder saloon model and made good use of its powerful (130bhp) 2584cc engine. 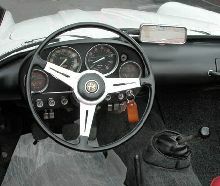 Standard equipment included a five speed gearbox and servo assisted disc brakes. The 2600 Berlina had a large four door body with all of the usual Alfa styling cues. Unfortunately the car did not sell in great numbers (just over 2,000 cars) and the model was eventually discontinued in 1969.